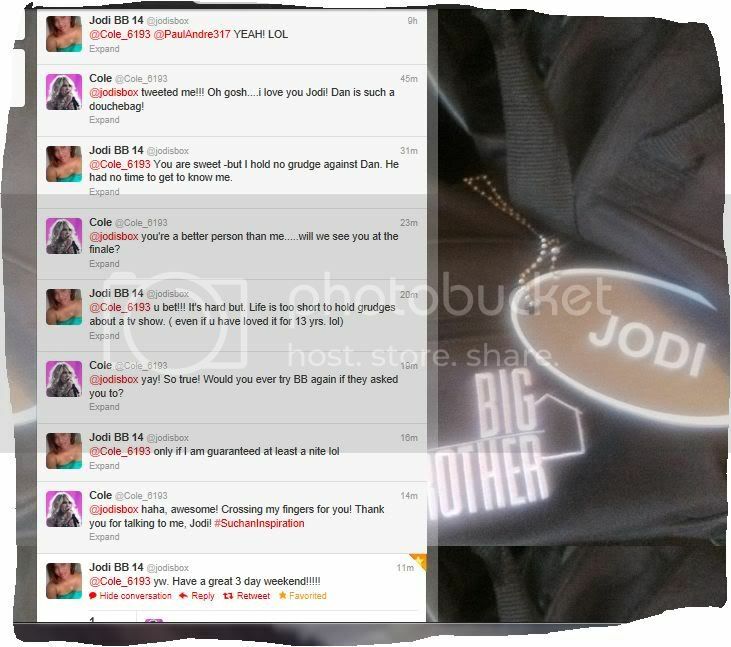 If anyone watches the show (I know Anthony hates it, lol) Jodi from this season of Big Brother tweeted me!!! It definitely made my month, because she was one of my favorites and she was so sweet on the show! But she didn't last a night. It was really unfair what happened to her. Julie Chen was like, someone is getting eliminated tonight! Jodi's team lost the challenge, and Dan was her coach, so he had to pick one person to leave. He chose her, like a douche, and he's still on the show. I can't stand him! But oddly enough Jodi does not hold a grudge against him! She said she would try BB again if they asked her to and she will be at the finale! She is such a big fan of the show and a genuine person, I hope she gets another shot. Probably the second most famous person I've talked to, since Laurie Holden tweeted me! Say what you want about Dan, what he did to get off the block last week was as good of a move that anyone has ever done on the show including things pulled by Dr. Will. epicamends and supercarriefan like this. I am a BIG BIG fan of Big brother and I have to say DAN is an excellent player. This is a game and you have to do what's best for you! unfortunately, Jodi was a casulaty to the game!!! I hope Dan makes it to top 4 at least!!! He just pulled the BEST move on BB History!!! Dr.Will was luck that their is no VETO on his season and the voter saw the diary room confessions!!! Jess is a Big Brother fan. Very cool! I get excited when my favorite people tweet me, too (I cried when Matt Sorum DM'd me). I think that Dan has a really good shot at winning, he is going to screw Ian the first chance he gets, Joe & Jen can't win HOH to try to get him out, Frank is likely going to be the first one to go home on Thursday, Danielle will never put him up and Shane for as good of a guy that he seems to be and good at the comps he doesn't seem to be able to think for himself, he lets others influence him to much when he is the HOH. I felt bad for Jodi having to leave the first night - she seemed like a nice person. But I guess someone had to go. They've really got to narrow things down - there's only 3 weeks or so left, but still 7 players. This week is another double eviction week. Getting so close to the end! I have major respect for Dan as a player - I usually pick faves who are awesome in the competitions (Daniele, Janelle, etc. ), but Dan's move this past week was even more impressive IMO. I still can barely believe he managed to pull it off. If he manages to make it to the final 2 again, I think he deserves to win. Dan's a genius lol. That move from last week will go down as one of the best in BB history. Dan is a smart guy, and doesn't make any decisions without thinking it all through. He always seems to be one step ahead. He deserves to win. While other great players in BB's past have relied partly on luck, Dan actually has played the game in every way. Danielle and Shane have rode other people's coattails and let others think for them. I'm not sure how Joe is even still there. Jenn, while she did pull a good move this week, is so easily lead it seems, and Dan will use her and get rid of her. Frank is good, but I don't know if he can outsmart Dan in the end. Ian is becoming a little hotheaded at the moment, and needs to cool it if he wants to win. He is putting a target on his back right now. They need to get rid of Frank. He will win with the jury hands down. Dan should know this better than anyone given that he won his last season by 7-0. Frank is good at competitions, but he has also gotten really lucky too. He should've been evicted the week they reset the game and let the coaches in. IMO there was no reason to cancel that week's eviction - the producers just didn't want Frank gone yet. Dan is going to use everyone at some point, lol. He is just so calm & cool and has that Dr. Will ability to get everyone to work with him even though he should be the least trusted in the house, he will take Ian out at some point, he has Danielle in his back pocket and it will not be hard to get Shane and Joe/Jenn to vote Ian out, I could see Ian being the second person sent home on Thursday, he can't be in the HOH and Dan would much rather keep around Joe & Jenn since they pose little threat in the comps. The HOH, veto and 2nd eviction should be a lot of fun on Thursday. If anyone wants spoilers I know who is on the block and who won the veto. I read the spoilers too. This week's shows should be a good time lol. I can't wait to see what goes down on Thursday night during the double eviction. After the way he has played with her emoitions more than once and I don't think that it will never happen but it would be pretty damn awesome if Danielle took Dan out. JB spoil me! Who won?? you are not going to like the results!!!! Uh.. Cole tweeted me today. That's about as famous as I get. The only way I'll ever be on TV is for unfavorable/unflattering circumstances. I think that we could see Dan pull the trigger on taking Ian out with the 2nd eviction on Thursday, Ian can't play in the HOH and it will not take much of a effort on Dan's part to form a pact with whoever else is left to put Ian on the block and unless Ian can with the veto against everyone else he will be out the door, I don't see anyone beating Ian if he got the final two. From watching the after dark show, they were told about the last double eviction the night before, so I would imagine they will be told again and if that does happen I think that Dan will put the evict Ian plan into place. Everyone else is going to have a great chance to take Dan out if he doesn't win HOH but until someone actually wises up to pull that off I don't see it happening. lol. I loved Britney on the show, but her twitter is so disappointing. Shes nothing like that in real life. Janelle's twitter is pretty interesting. She tweets a lot about the show now that she's out of the house. She is calling Danielle out for being delusional. Danielle does seem kind of crazy, the look on her face when Zingbot made the comment about Shane getting a restraining order was really funny, she was pissed.